Finding a vehicle that has all the features and specs you’re looking for can be difficult. Maybe you’re searching for something with plenty of cargo space but you don’t want to spend a small fortune on fueling costs. 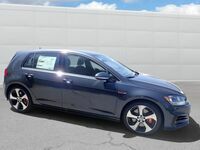 Or maybe you’re looking for a vehicle that has a high-quality interior and attractive exterior but you are hoping to skip the hefty price tag. We are big believers that the perfect vehicle does exist. 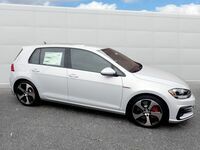 We call it the 2017 Volkswagen Golf GTI. 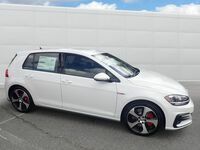 The 2017 Golf GTI offers drivers a respectable fuel economy rating, a hatchback design to optimize cargo space, a fun-to-drive attitude and a refined demeanor usually saved for much more expensive vehicles. Read on for more features and specs of this great compact hatchback! The 2017 Volkswagen Golf GTI comes in four trim levels: S, Sport, SE and Autobahn. All trim levels come standard with a 2.0-liter turbocharged engine that makes 258 pound-feet of torque, and the S’s engine generates 210 horsepower while all other trims make 220 horsepower. Drivers can also choose between a manual and automatic transmission for all trims. Looking to stay entertained throughout the duration of your journey? The 2017 Volkswagen Golf GTI has you covered. All trim levels come standard with VW Car-Net® App-Connect, which allows drivers to connect compatible smartphones to access select apps right from the 2017 Golf GTI’s dash. Apple CarPlay and Android Auto are also standard on all trims. 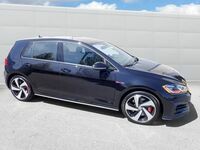 The 2017 Volkswagen Golf GTI has a wide variety of advanced safety systems available, like Front Assist, Blind Spot Monitor, Rear Traffic Alert, Adaptive Cruise Control, Autonomous Emergency Braking, Park Pilot, Park Assist and Lane Assist. All trims also come standard with a rearview camera and the Automatic Post-Collision Braking System. 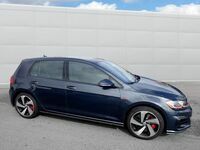 Want to learn more about the 2017 Volkswagen Golf GTI? Don’t hesitate to contact our sales team here at Dirito Brothers Walnut Creek Volkswagen with any questions. Drivers ready to get behind the wheel of this great compact hatchback? Schedule an obligation-free test drive online or come in and see us at our location in Walnut Creek.